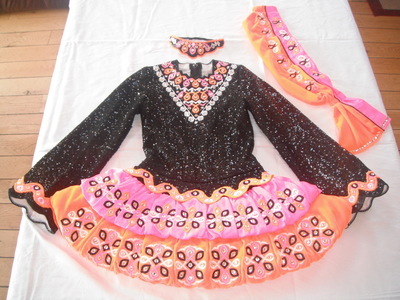 Stunning Siopa Rince designed costume. Black, pink and orange in colour. suitable for 9-11yr old, selling due to growth spurt. Embellished with Swarovski Crystals. Fabulous stage presence. Complete with shawl, hairband, kickpants and accessories. Asking Price: €500. Shipping costs are included in the asking price for worldwide shipping. Sale is final.